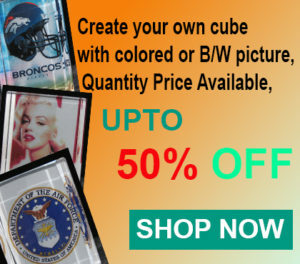 Welcome to Cubecrystal Online Shopping Store ! Photo & Text Engraving Guideline: 1, Each engraving on this crystal design using the same text. 2, We will adjust font size depending on how many characters you typed in, the more letters you enter, the smaller the font size. 3, You can choose the font style, options are Arial, Times New Roman, Edwardian Script and Monotype Corsiva. if you want to use other font styles, please email us. 4, Most custom picture & text engraving orders will be shipped within 3 to 5 days. 5, Please either email us or tell us on the checkout page if you need it in rush, we will get it done in 1 to 2 days, $5.00 will be applied for rush orders. 6, To have your most valued photos engraved into high quality optical glass, we simply need your digital photo as a master, It can be sent in various formats such as .jpg, .bmp, and .png. We are dedicated to provide excellent customer service on all of our product orders, if you have any questions please contact us.